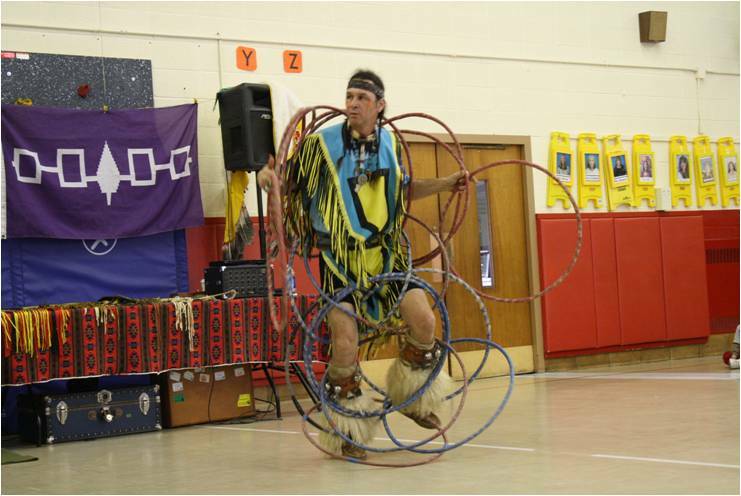 The children of John Paulding School were lucky enough to have Little Hawk, a member of the Mohawk Tribe, entertain them with his presentation on traditional Native American tribal dances. Additionally, he taught the students words, songs and some of their customs. Little Hawk displayed his athleticism and stamina by dancing in and out of 18 hoops. With these hoops he formed different animals such as the duck and the eagle. He also performed the challenge dance, which is a dance of strength, balance and skill. The person challenged must pick up a feather with his/her teeth and the ONLY part of the body touching the floor are the feet. The children enjoyed attempting to pick up the feathers using their teeth! Little Hawk shared that everything on earth has a purpose and he reminded the students that they should protect the earth for our future.